Many people are confused about who they are and what purpose there is for their life. We tend to base our identity upon things like: gender, age, skin color, cultural heritage, wealth, marital status, winner or loser. God does not look at us in those ways. He sees us in one of two ways: in Christ or not in Christ. Rarely do we see ourselves as God does. We either think too little or too much of ourselves and our abilities. For example, Gideon was a great judge in Israel, but his exciting story in Judges 6-8 begins with Gideon’s identity problem. Judges 6:11-24 Now the angel of the LORD came and sat under the terebinth at Ophrah, which belonged to Joash the Abiezrite, while his son Gideon was beating out wheat in the winepress to hide it from the Midianites. And the angel of the LORD appeared to him and said to him, “The LORD is with you, O mighty man of valor.” And Gideon said to him, “Please, sir, if the LORD is with us, why then has all this happened to us? And where are all his wonderful deeds that our fathers recounted to us, saying, ‘Did not the LORD bring us up from Egypt?’ But now the LORD has forsaken us and given us into the hand of Midian.” And the LORD turned to him and said, “Go in this might of yours and save Israel from the hand of Midian; do not I send you?” And he said to him, “Please, Lord, how can I save Israel? Behold, my clan is the weakest in Manasseh, and I am the least in my father’s house.” And the LORD said to him, “But I will be with you, and you shall strike the Midianites as one man.” And he said to him, “If now I have found favor in your eyes, then show me a sign that it is you who speak with me. Please do not depart from here until I come to you and bring out my present and set it before you.” And he said, “I will stay till you return.” So Gideon went into his house and prepared a young goat and unleavened cakes from an ephah of flour. The meat he put in a basket, and the broth he put in a pot, and brought them to him under the terebinth and presented them. And the angel of God said to him, “Take the meat and the unleavened cakes, and put them on this rock, and pour the broth over them.” And he did so. Then the angel of the LORD reached out the tip of the staff that was in his hand and touched the meat and the unleavened cakes. And fire sprang up from the rock and consumed the meat and the unleavened cakes. And the angel of the LORD vanished from his sight. Then Gideon perceived that he was the angel of the LORD. And Gideon said, “Alas, O Lord GOD! For now I have seen the angel of the LORD face to face.” But the LORD said to him, “Peace be to you. Do not fear; you shall not die.” Then Gideon built an altar there to the LORD and called it, The LORD Is Peace. To this day it still stands at Ophrah, which belongs to the Abiezrites. Gideon was fearful of the Midianites who periodically terrorized his community and stole their food. He had no hope of deliverance since he believed God had abandoned him and didn’t care about his life. Therefore, Gideon saw himself as the most unlikely person in the world to be a leader and deliverer of Israel. Today you may be struggling with a painful past that is still defeating you. As a result, you may think God has abandoned you and can’t possibly use you. If so, you need to see yourself as God sees you in Christ, if indeed, you are in Christ. But what hinders us from doing that? Gideon was not prepared for such an assignment. He not only had a lot of questions and doubt, but his self-defeating labels were stuck tight. Have you ever tried to get the label off of a jar? Sometimes it is a real chore. The labels from Gideon’s past were sticking even more tightly than this. He came up with all kinds of objections, and they revealed what he thought about himself and God. 1. “How can I?” he asks. What he is saying is “I can’t.” That label defeats us before we begin, so we don’t try. 2. “My clan is the WEAKEST in Manasseh. And I’m the LEAST in my family.” He is saying, “Nobody will follow me, and if everyone I know did, we are too few in number to succeed. 3. I don’t believe you. If you are really serious, prove it by giving me a sign. Just like us, Gideon’s success was not dependent on his family background or his past. It was not dependent on his present circumstances. It depended on what the Lord said, “But I will be with you.” At first, Gideon failed to realize that with the Lord, he had all that was necessary for success. Do you have labels on you from the past that are still defeating you? Most people do. Do you remember Dan Brennan (not his real name)? He lived with us for 5 months. He had been labeled bi-polar, learning disabled, and placed in special education. He believed he was mentally unstable, weird, unable to learn, and he had no hope of being a success. Video games were his life. To prepare for home school, we gave Dan a placement test. Fortunately, He could read well. He placed in 6th grade although he was considered a junior in public school. He was ashamed of his lack of knowledge, his low placement, and didn’t think he could do any better. To him, the test proved the labels were correct. He was hopeless. He was not prepared for two full-time tutors who believed he was intelligent and could catch up quickly. Also, video games were allowed only after school work was completed. He relaxed when he discovered no question was a dumb question, no one made fun of him for not knowing or wanting to know. Learning became fun. Dan learned to write essays, give speeches, and solve algebra problems. His biggest change in identity happened when he became a believer and gave his life to Jesus Christ. Once he became a new creation in Jesus Christ, he had hope for the future. In Christ, he had value, purpose, and success. He was no longer what others had labelled him. He went on to write and direct his high school play and graduate with honor. Just like us, in order for Gideon to get past his labels, he had to believe God. At first, he rehashed all of the objections as to why he couldn’t do anything, why he wasn’t capable. He had to let go of the past, his objections, and look forward to going with God. The labels we place on ourselves are more limiting than the ones that others have placed on us. When we tell ourselves, “I am dumb, I will never succeed, I don’t deserve any better,” that is the way we act. We don’t even try to do better because we don’t believe what God says and we are convinced we are what the labels say we are. But he didn’t. He believed God was with him and he acted on his faith. God sees our potential underneath all of the labels that people have placed on us or that we place on ourselves. Let God heal your painful past by believing Him. Stop looking at yourself and focus on Jesus and what He can do. Then act according to what God says about you. Believe what God says. Obey what God says to do. Repent and stop sinning. That means quit doing drugs, quit being sexually immoral, quit gossiping, and quit reliving your past and excusing your sin. In other words, quit doing things that bring defeat. Quit acting like a child of the devil and begin acting like a child of God. Be filled with the Holy Spirit and walk in His ways. Take every thought captive and put the labels out of your mind. All this is called faith. If you have faith in what God says, you will act accordingly. Abraham is a good example of someone who had faith in God and acted according to God’s word. Abraham had the promises of God but didn’t yet have the reality. In spite of all the physical evidence contrary to God’s promise, Abraham was fully convinced that God was able to do what He had promised. So Abraham acted on what God said instead of the evidence. Having seen the Lord, Gideon had a revitalized faith in God and he took his eyes off of himself. He was filled with the Holy Spirit, obeyed what God told him to do, and trusted God to give him success. Judges 6:34 Then the Spirit of the Lord came upon Gideon and he blew a trumpet summoning the Abiezrites to follow him. Chapter 7 begins with Gideon defeating the Midianites. He got the labels off by believing what God said was true and by taking steps of obedience. God gave Him a new identity—from fearful farmer to a mighty warrior. Today, He can do the same for us to heal our painful past, give us a new identity, and set us on a new path—if we will only believe Him and obey. When I look at myself, I see that in my flesh there dwells no good thing. When I look at my righteousness, it is as filthy rags. When I look at my works, they seem like they are in vain. And all of that is true. But God says in Philippians 4:13 I can do all things through Christ who strengthens me. Therefore, I need to take my eyes off of me. And when I look at Jesus, I see victory. When I look at Jesus, I see overcoming. When I look at Jesus, I see the Resurrection and the Life. I see One who has all power in Heaven and in earth. I see the King of Kings and the Lord of Lords. I see the great I Am! And He is with me! And I am His! I am a child of God. My identity is in Christ! I am a temple of the Holy Spirit, and as long as I am filled with the Spirit and obeying Him, I am in the process of becoming like Jesus! I can do all things through Him who strengthens me! Therefore, Romans 8:35-39 Who shall separate us from the love of Christ? Shall tribulation, or distress, or persecution, or famine, or nakedness, or danger, or sword? As it is written, “For your sake we are being killed all the day long; we are regarded as sheep to be slaughtered.” No, in all these things we are more than conquerors through him who loved us. For I am sure that neither death nor life, nor angels nor rulers, nor things present nor things to come, nor powers, nor height nor depth, nor anything else in all creation, will be able to separate us from the love of God in Christ Jesus our Lord. 1. Tribulation; to undergo struggle, trials, temptation, suffering, and affliction. 2. Distress; to suffer anguish, trouble, strain, agony; not knowing which way to turn or what to do. 3. Persecution; to be abused, mocked, ridiculed, shamed, mistreated, ignored, neglected, harassed, attacked or injured. 4. Famine; to have no food, to be starving, and have no way to secure food. 5. Nakedness; to be stripped of all clothes and earthy comforts, to be bare, having all earthly possessions taken away. 6. Danger; to be exposed to the most severe risks, to be confronted with the most terrible dangers to one’s body mind, soul, property, family, and loved ones. 7. Sword; to be killed. These are some terrible situations but the key word in the text is “No”. No, these things are not able to separate us from the love of God, because in all these things, we are more than conquerors. In Christ, we can conquer famine and nakedness because Jesus said in Matthew 6:31-34 So do not worry, saying, ‘What shall we eat?’ or ‘What shall we drink?’ or ‘What shall we wear?’ For the pagans run after all these things, and your heavenly Father knows that you need them. But seek first His kingdom and his righteousness, and all these things will be given to you as well. Therefore, do not worry about tomorrow, for tomorrow will worry about itself. Each day has enough trouble of its own. That is a key question. If we don’t or won’t believe Jesus, then we will be shackled by labels, doubt, fear, and defeat. Put your faith in Jesus Christ and not yourself. Believe what God says about you and in what He can do if you will obey. Ask God to fill you with the Holy Spirit (God in you) and follow Him. Then you will see amazing things that God will do through you. If you are tired of living with the identity you have been labeled by others and yourself, believe in Jesus Christ as your Savior and Lord, who died on the cross to atone for your sin and to give you a new life, born of the Spirit of God. Repent of your unbelief and disobedience. 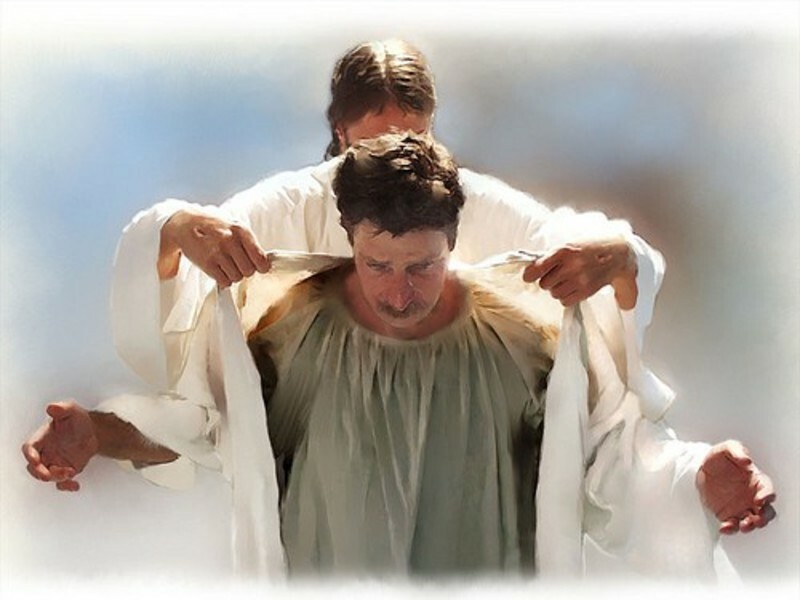 If you are ready for a new identity in Christ, repent of being your own god and give your life to Jesus by publicly confessing Him as the Son of God and following Him in baptism. Then you will born of the Spirit and become a new creation, a child of God. He will lead you to be a conqueror over all the tribulations and trials of this world, and onto eternal life as the Bride of Christ.